Whether your child attends public school or private school, high school or college, back-to-school shopping is always an added expense. But this year, the cost is expected to be slightly less per family than it was last year. While back-to-school spending last year averaged $688.62 for families with K-12 children, spending this year is expected to average $634.78, according to the National Retail Federation. In total, families are expected to spend a total of $26.7 billion for K-12 children, although that number reaches $72.5 billion when college-aged kids are added to calculations. The biggest cost for back-to-school shoppers? Apparel and accessories, followed by electronics. Capital One broke down the cost of back-to-school shopping per child, finding that 32 percent of parents plan to spend $100 or less per child, and that 21 percent plan to pay more than $200 per child. Still, 21 percent of parents spend more on September school supplies than they save for their child’s college education each year, according to Capital One's data. Huffington Post blogger Adam Levin recently pointed out that it is important for parents to have an established budget before they start shopping. He also noted that sometimes it is better for parents to shop without their kids, in order to avoid pressures to make unnecessary purchases. "Unless it is absolutely necessary (or a family bonding exercise) to have them with you, it's best to leave the munchkins at home," writes Levin. "If you want to know their preferences, browse with them online before hitting the stores. The last thing you need is to be weaving through crowds at Staples, Kmart or Target, or navigating several online retailers, while fending off cries of, 'Mommy, I really NEED to have this.'" On the other hand, Huff Post blogger Samantha Kemp-Jackson recently wrote that bringing her kids along for back-to-school shopping trips makes it easier and more efficient. "By letting the kids exert a little bit of control over what they want, you'll have more willing and compliant shoppers during your outing, and isn't that what we're all looking for?" wrote Kemp-Jackson. Capital One advises that back-to-school shopping season is the perfect time for parents to talk to their children about budgeting and financial literacy. “Many parents say they’re talking with kids about important concepts like wants vs. needs this shopping season -- which is great news -- but parents can further reinforce those practices by building a shopping budget with teens, discussing priorities and trade-offs, and comparison shopping together to get the best deals,” Shelley Solheim, Capital One's director of financial education, said in a statement released by the company. No matter how much you plan, however, surprise costs could crop up. In July, HuffPost Live interviewed a mom who received from her child's public high school a bill for nearly $600, which included a charge for a $300 Chromebook laptop that students were required to buy even if they had a different kind of computer at home. And there might be another reason to spend less on back to school shopping. 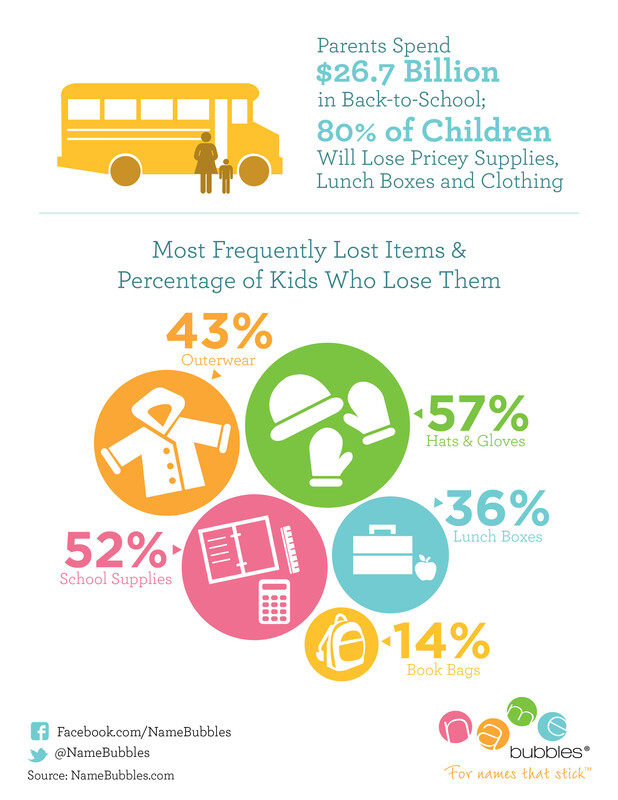 A report from NameBubbles.com shows that most kids end up losing many of their shiny new supplies by year's end.